This page covers the development of botanical art in Asia between 600 and 1900 AD. This will take a while so I've decided to start publishing while it is in progress. Two recurrent names are already emerging. 'The East India Company' and 'Sir Joseph Banks' are associated with a lot of the discoveries of plants and the development of botanical illustration in the 19th century. became established as a proper art form during the Tang dynasty (618-907) - which is is regarded as a highpoint of Chinese culture. Artists not only directly portrayed the outer beauty of flowers, they also expressed the subtle spirit and demeanor of their subject. "To be without method is deplorable, but to depend entirely on method is worse." “boneless” washes (沒骨) - painting with outlines or previous sketches. “baimiao (白描)” ink lines - this technique involves an emphasis on painting outlines using fine lines of ink and a few light tonal washes of ink to indicate form. This technique never uses colour. Also called the "white lines" technique. How paintings of flowers and plants were constructed was also influenced by the earliest record of Chinese art Theory - the six principles of chinese painting. This relates to the Gu Huapin Lu (“Classified Record of Painters of Former Times”) by Xie He (a.k.a. Hsieh Ho) published in the 6th century. In this he rates 27 painters in three classes of descending merit, each with three subdivisions. He explains the criteria for the rating and ranking as the six principles. "Spirit Resonance," or vitality, and seems to translate to the nervous energy transmitted from the artist into the work. The overall energy of a work of art. Xie He said that without Spirit Resonance, there was no need to look further. "Bone Method," or the way of using the brush. This refers not only to texture and brush stroke, but to the close link between handwriting and personality. In his day, the art of calligraphy was inseparable from painting. "Correspondence to the Object," or the depicting of form, which would include shape and line. "Suitability to Type," or the application of color, including layers, value and tone. "Division and Planning," or placing and arrangement, corresponding to composition, space and depth. "Transmission by Copying," or the copying of models, not only from life but also the works of antiquity. One of the problems with identifying artists is the different names attributed to them over time. Developing a list of important flower painters will take time! Flower painting became established - but little survives. Xu Xi (Hsü Hsi) d. 975 - ​The most famous of all Chinese painters of flowers, fruit and birds according to Blunt. He lived during the Five Dynasties and Ten Kingdoms period. He was famous for his "drawing from life" and his use of color. Huáng Quán (Huang Chüan) (903-965) was an Imperial Painter who was renowned for his paintings of was renowned for his paintings of flowers and birds, plants and insects. Chao Ch'ang lived in Szechuan and was famous for his paintings of flowering plants and cut branches, vegetables and fruits. He painted from observation and often refused to sell his paintings. Interestingly very few of his paintings have survived as a result. Wang Tingkuo was from K'aifeng in Honan Province. He specialized in painting flowers and birds. His paintings are in light colors and possess an unusual degree of refinement. ​John Reeves (1774–1856) was appointed as a tea inspector in 1808 and started to travel to China. He met with and was appointed by Sir Joseph Banks to be one of his many collectors. he was also He was also a keen amateur naturalist and artist and also collected drawings! The link provides a detailed explanation of how the collection came about. The commissioned paintings were executed on thick, cream English watercolour paper, predominantly produced by Whatman and made from cotton rag, measuring at least 48 x 36cm. Plants have always been important to the practice of Ayurvedic medicine which is one of the world’s oldest medicinal systems. However, unlike in the west, the practice of medicine does not seem to have triggered the development of botanical illustration to ensure plants are identified correctly. 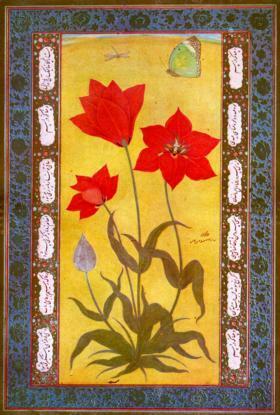 There was no true botanical illustration until the time of the Mughal Emperors who were genuine nature lovers. 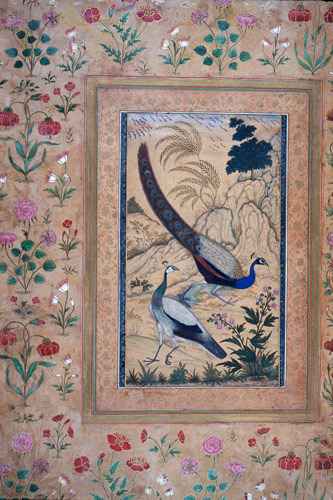 Mughal emperors commissioned botanical and ornithological studies from their court artists. One of the most notable emperors was Jahangir (1569-1627) who was interested in painting serving his other interest in the scientific basis of nature. Ustad Mansur (active 1590-1624) was a seventeenth-century Mughal painter and court artist during the reign of Jahangir. He painted flowers - however animals and birds appear to have been his speciality and flowers and plants were often relegated to a supporting role. Ustad [Master] Mansur has become such a master in painting that he has the title of Nadiru-1-'asr [Wonder of the Age], and in the art of drawing is unique in his generation. "This year [A.D. 1620], in the little garden of the palace and on the roof of the chief mosque, the tulips blossomed luxuriantly. There are many blue jessamines in the gardens, and the white jessamines that the people of India call chambili are sweet-scented.... I saw several sorts of red roses: one is specially sweet-scented.... The flowers that are seen in the territories of Kashmir are beyond all calculation. Those that Nadir al-casr Ustad Mansur has painted are more than 100"
The depiction of formal flowering plants is synonymous with the reign of Shah Jahan (I628-57). The portrayal of plants is seen in the borders of paintings and albums and architectural decoration. Examples of the latter include the the carved stone and pietra dura work in buildings like the Taj Mahal and Red Forts in Delhi and Agra. They can also be seen in material for sashes, robes and metalwork and jade carving. Recording plants in paintings seems to have been reinforced by Europeans resident in India who either wanted records of their time living in India or wanted practical records because of their job. So, for example, a number of physicians working for the East India Company were interested in botany and plants and wanted paintings of what they found. Many Indian artists worked for patrons in the East India Company. The term used for this body of artists is the Company style. Many had been trained in schools set up in major cities by the British to train Indian artists in Western Techniques. Company School artists typically worked in watercolour on paper and recorded whatever interested their patrons. The style in fact varied by the different centres/cities. They recorded all aspects of the land and culture. Some artists specialised in producing large paintings of the plants and flowers of India. Very few Company paintings of plants seem to have been digitised. However a number are regularly included in botanical art exhibitions at Kew. This book tells the story of the collections made by those who studied the botany of India. Itis illustrated with 86 drawings that are both scientifically accurate and stunningly beautiful. Included are examples made in all three of the administrative units of British India, the Presidencies of Bengal, Bombay and Madras between 1770 and 1860. Teams of botanical artists were employed at the East India Company gardens of Calcutta and Saharanour. Often we do not know the names of the artists. Collections of paintings by Company School artists are often known by the name of the collector. However certain patrons employed the same artists and we know their names. One of three artists employed by Mary Impey - wife of Elijah Impey, the first Chief Justice of the Supreme Court, Fort William - who commissioned over three hundred paintings. A trilogy of volumes in a slipcase is the second in a series of illustrated works devoted to collections of botanical drawings made by Indian artists for Scottish surgeon-botanists, held in the library of the Royal Botanic Garden Edinburgh. some 200 of the drawings commissioned between 1826 and 1853 by Robert Wight (1796–1872) from the artists Rungiah and Govindoo. essays on The Validity of Botanical Art as a Scientific Tool and The Artists. Several thousand botanical drawings were commissioned in India, from Indian artists, by Hugh Cleghorn (1820-1895). William Roxburgh (1751-1815) was known as the ‘Father of Indian Botany’. In India he commissioned about 2500 drawings of Indian plants from a team of Indian artists. These are known as the ‘Roxburgh Icones’. RGBE have a a set of about 500 extremely fine, partially coloured, ink copies based on the original Roxburgh Icones, made in the Calcutta Botanic Garden 1815-20. The names of the botanical artists employed by Roxburgh are not known. In this book, more than 200 of the drawings from the Cleghorn Collection are reproduced, in colour, for the first time. These include drawings from nature, copies based on European prints, and Nature Prints made from herbarium specimens. They are the work of several South Indian artists and of pupils of the pioneering Madras School of Art. Forests and Gardens of South India: Botanical Drawings Commissioned by H.F.C. Cleghorn (2010). ​A book about the watercolour paintings of plants grown in the botanic gardens in Bombay in the middle of the 19th century. These were commissioned by Alexander Gibson, an East India Company surgeon. Gibson wrote the Bombay Flora with Nicholas Dalzell. An unknown Portugese-Indian artist created the watercolour paintings which were made between 1847 and 1850. The plants are not all native to Bombay and western India. Half are exotics from as far afield as Argentina and Australia. 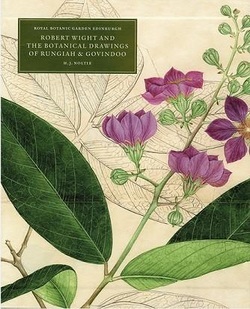 The book includes information about Gibson's life and work (including his role as a pioneering forest conservator) and a history of Dapuri and Gibson's other botanic gardens. 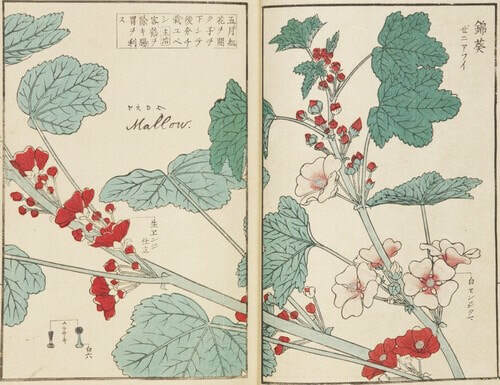 Traditional Japanese botanical paintings of flowers and plants takes a number of forms. However the development of paintings of plants and flowers were made for aesthetic reasons and to give pleasure to others rather than for the scientific reasons normally associated with botanical art. Japanese painting began to be influenced by western art in the latter part of the 19th century. ​Below I'm developing a list of people who are important to the story of the development of Japanese Botanical Art. Swedish naturalist and doctor Carl Peter Thunberg. 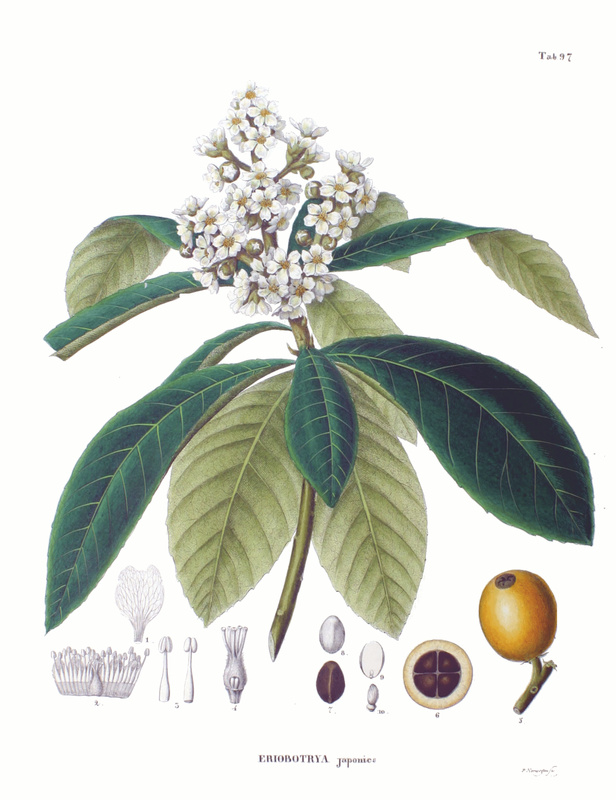 Thunberg also introduced the Linnean system for classifying plants to Japan. He is renowned for introducing western medicine to Japan and for bringing Japanese plants to the west - along with scientific records which include botanical drawings. developing a collection of c. 12,000 dried plant specimens of 2,000 species - with the help of his assistant H. Bürger (1804–1858). assembling a large collection of books and other matter relating to Japan. On his return he met the German botanist Joseph Gerhard Zuccarini and together they developed a plan to create and publish a Flora Japonica. Zuccarini was respondible all the Latin names. Siebold provided the Japanese and Chinese names, a description of where they grew, their use, cultivation and history in French. Most of his collections can be found in SieboldHuis the museum dedicated to him in Leiden where he lived after his return. Ogata Kōrin (1658 – June 2, 1716) was a Japanese artist of the Tokugawa period (1603–1868), lacquerer and designer. He was regarded as one of the masters of the Sōtatsu-Kōetsu school of decorative painting.The Rinpa style involved simple natural subjects such as birds, plants and flowers, with the background filled in with gold leaf. 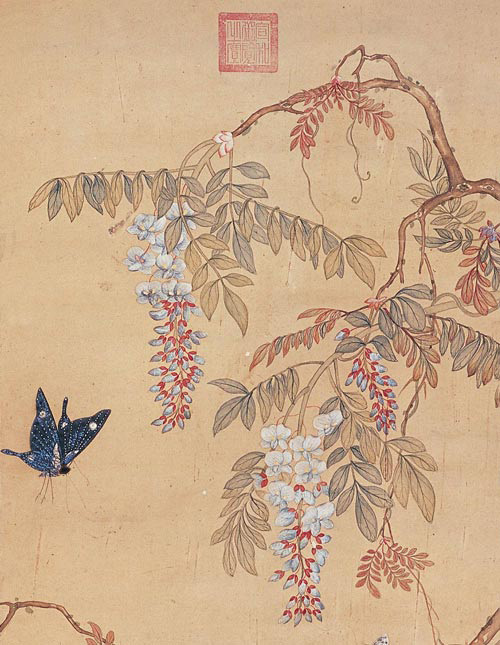 Korin created screens on which he painted various motifs - some of which were botanical in nature. His screens with blue iris (c.1709) s regarded as one of his masterpieces and is very well known. c. 1811 he was appointed as a painter for the Dejima Factory. This was on the island where all non-Japanese where segregated so they did not pollute Japanese culture. He painted things Japanese in response to requests from Blomhoff (director of the Dutch East India Company Dejima Factory), Fisscher (a Dutch East Indian Company employee), and Siebold (a physician at the Dutch East India Company Dejima Factory). In a way he was a 'Company Painter'. He was taught the principles of western painting techniques in order to do botanical paintings and then introduced these to other Japanese artists. He published 76 of his original drawings as Keiga Shasin so (1836). Hunt Institute: Talking in Flowers: Japanese Botanical Art 5 April – 16 July 1982 - Included examples of brush painting and woodblock printing. A catalogue accompanied the exhibition. This page is a work in progress. I welcome any suggestions as to the artists who could be included above who lived before 1900. Please also include URLs to information about the artist.